In 2008, productivity suite empire Zoho launched a simple invoicing tool, unsurprisingly called Zoho Invoice. Today, the startup is releasing a new version of its Invoice, dubbed Invoice 2.0, that has a fresh user interface and provides a more open application. The fact is that over the past two years, there have been a plethora of online invoicing startups that have popped up and Zoho is catching up to its competitors with version two of its offering. With this update, Zoho has redesigned its UI making it easier to navigate and customize to fit the look and feel of a business’ design. Zoho Invoice will also allow users to record separate expenses they incur while serving particular clients (like travel, material etc). 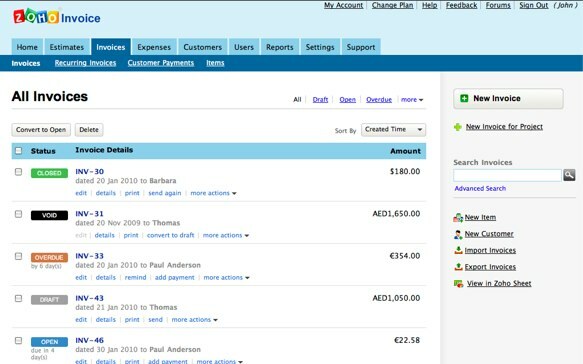 The version also has full organization, multi-user support so that several employees can access and collaborate on invoices for a particular account. And Zoho has opened up the API for Invoices to that developers can integrate the application into their own applications. Additionally, Zoho features useful bells and whistles such as multi-currency support and email history which tracks your email exchanges with your clients and other users. The plus of using Zoho’s invoicing application is that it ties into its other productivity applications seamlessly. And its affordable, with a free version and the most expensive version coming in at $35 per month. Last year, we wrote that Zoho has continued to implement an intelligent strategy to launch new products and add-ons to its existing offerings, partly to keep users from flocking to Google Apps and Microsoft’s Web-based version of Microsoft 2010. It looks like Zoho is continuing this strategy in 2010. Last year, startup unveiled a new version of Zoho Reports; launched a deeper integration with Google Docs; rolled out Zoho Discussions, a online forum tool for businesses; and debuted Zoho Recruit. And over the past two years, Zoho has added support for Sharepoint, mobile, Google and Yahoo IDs and group sharing. According to out latest states, Zoho has definitely reached over 2 million users is even catching the attention of its competition. Hopefully, 2010 will be as fruitful as 2009.